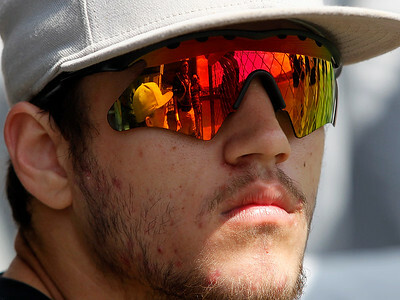 Matthew Apgar - mapgar@shawmedia.com Jacobs's Brenden Heiss focuses on the game as his teammates are reflected in his sunglasses during their class 4A sectional final on Saturday, June 6, 2015 at Cary-Grove High School in Cary. Jacobs beat Boylan 8-2 to win the sectional championship. Matthew Apgar - mapgar@shawmedia.com Jacobs pitcher Ryan Sargent fires off a pitch to a Boylan Catholic batter during their class 4A sectional final on Saturday, June 6, 2015 at Cary-Grove High School in Cary. Jacobs beat Boylan 8-2 to win the sectional championship. 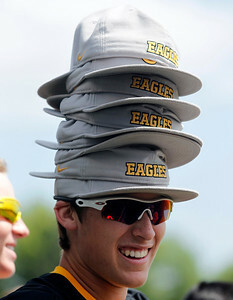 Matthew Apgar - mapgar@shawmedia.com Jacobs's Kraeton Moll is all smiles as he wears his teammates' hats atop his head during their class 4A sectional final on Saturday, June 6, 2015 at Cary-Grove High School in Cary. Jacobs beat Boylan 8-2 to win the sectional championship. 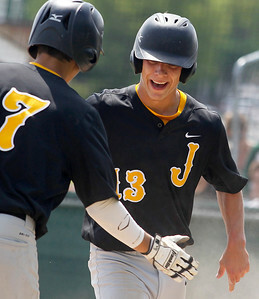 Matthew Apgar - mapgar@shawmedia.com Jacobs's Matt Kozlak, right, is greeted at home by teammate Stevie Krueger, left, after Kozlak scored a first inning run against Boylan Catholic during their class 4A sectional final on Saturday, June 6, 2015 at Cary-Grove High School in Cary. Kozlak would score again in the 6th inning after clearing the loaded bases with a hard-hit double. 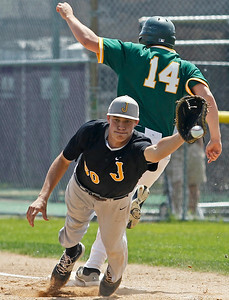 Matthew Apgar - mapgar@shawmedia.com Jacobs third baseman Owen Oreskovich fields the ball and makes the force out at first base against Boylan Catholic during their class 4A sectional final on Saturday, June 6, 2015 at Cary-Grove High School in Cary. Jacobs beat Boylan 8-2 to win the sectional championship. 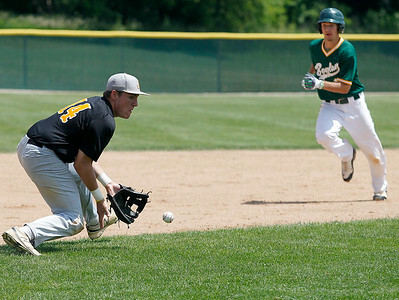 Matthew Apgar - mapgar@shawmedia.com Jacobs first baseman Casey Dennison stretches out for the ball which pulls him off the bag for Dalton Robinson of Boylan Catholic to reach safely in the first inning during their class 4A sectional final on Saturday, June 6, 2015 at Cary-Grove High School in Cary. Jacobs beat Boylan 8-2 to win the sectional championship. 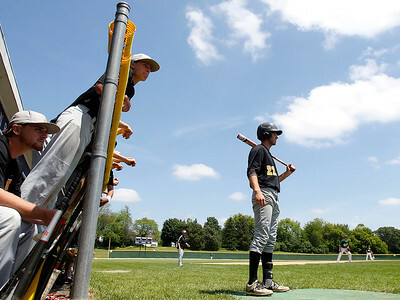 Matthew Apgar - mapgar@shawmedia.com Jacobs pitcher Ryan Sargent waits on deck against Boylan Catholic during their class 4A sectional final on Saturday, June 6, 2015 at Cary-Grove High School in Cary. 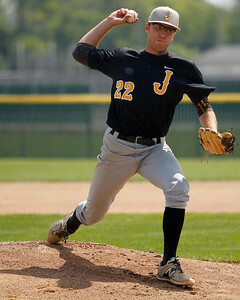 Jacobs beat Boylan 8-2 on 6 shutout innings by Sargent to win the sectional championship. Matthew Apgar - mapgar@shawmedia.com Jacobs pitcher Ryan Sargent, right, is congratulated upon returning to the dugout after scoring a run against Boylan Catholic during their class 4A sectional final on Saturday, June 6, 2015 at Cary-Grove High School in Cary. Jacobs beat Boylan 8-2 to win the sectional championship. Matthew Apgar - mapgar@shawmedia.com Jacobs third baseman Owen Oreskovich applies the tag to Boylan Catholic's Ian Parentico for the out during their class 4A sectional final on Saturday, June 6, 2015 at Cary-Grove High School in Cary. Jacobs beat Boylan 8-2 to win the sectional championship. 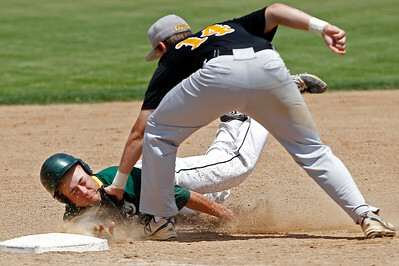 Matthew Apgar - mapgar@shawmedia.com Jacobs's Stevie Krueger slides safely into third base on a 6th inning double steal, beating the tag by Boylan Catholic's Dalton Robinson during their class 4A sectional final on Saturday, June 6, 2015 at Cary-Grove High School in Cary. Krueger would score later in the inning after teammate Mike Addante drew a bases loaded walk. Jacobs beat Boylan 8-2 to win the sectional championship. Matthew Apgar - mapgar@shawmedia.com Jacobs players celebrate their class 4A sectional final on Saturday, June 6, 2015 at Cary-Grove High School in Cary. Jacobs beat Boylan 8-2 to win the sectional championship. 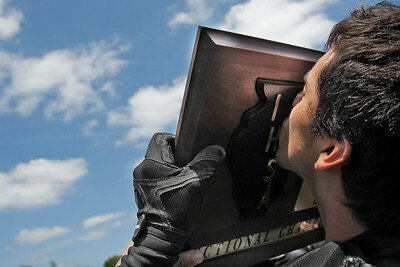 Matthew Apgar - mapgar@shawmedia.com Jacobs' Daniel Tenayuca puckers up and kisses the class 4A sectional championship plaque on Saturday, June 6, 2015 at Cary-Grove High School in Cary. Jacobs beat Boylan 8-2 to win the sectional championship. 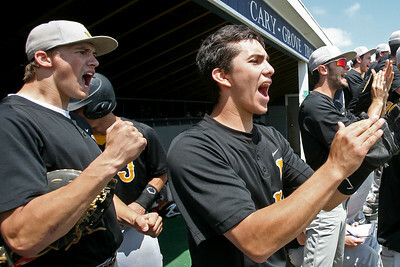 Matthew Apgar - mapgar@shawmedia.com Jacobs's Casey Dennison, left, and catcher Daniel Tenayuca erupt in cheer after a hit against Boylan Catholic during their class 4A sectional final on Saturday, June 6, 2015 at Cary-Grove High School in Cary. Jacobs beat Boylan 8-2 to win the sectional championship. 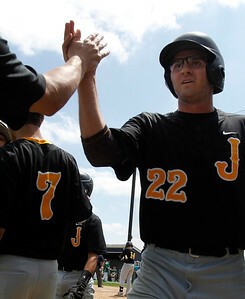 Jacobs pitcher Ryan Sargent, right, is congratulated upon returning to the dugout after scoring a run against Boylan Catholic during their class 4A sectional final on Saturday, June 6, 2015 at Cary-Grove High School in Cary. 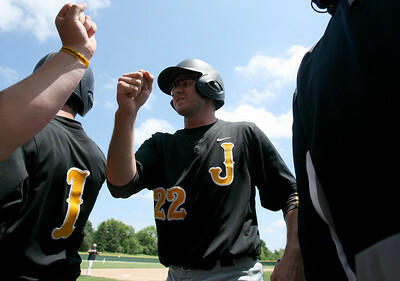 Jacobs beat Boylan 8-2 to win the sectional championship.